This semester, with great help from my teaching colleagues, General Chemistry is now taught at Georgetown with an overarching narrative, a story that binds and embraces all the topics covered. Chemistry is all about atoms - this is how we explain matter and all of its properties. Thus, even with a myriad of research publications showing up every year from chemists, some of which may end up gathering dust in libraries or go unbrowsed on the internet, these papers can still serve as foundations for future work for these not only contain descriptive observations and stand-alone guesses, but have gone through the test of either fitting in an established theory, or refining or even changing an existing one based on evidence. Myths have a much smaller chance of survival in the field of chemistry now since both the past and future are considered, and fads are then easily identified for these are simply not sustainable. A chemist cannot really cling on an idea just because it sounds appealing since truth must be fruitful. The evidence is the past and its fruits are the future. 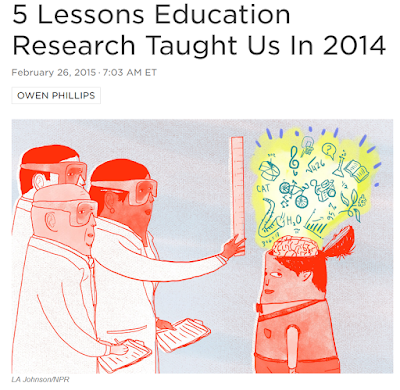 Education research oftentimes misses both. Carl E. Wieman in his article, The Similarities between Research in Education an Research in the Hard Sciences, writes: "...Although there is descriptive, hypothesis-generating research/observations carried out in all fields, in fields like physics or chemistry, such work is seldom considered publishable until it is followed up by quantitative controlled experiments, typically with proposed mechanisms and explanations. Many areas of both biology and education research are similar to where many areas of chemistry and physics were 100 to 150 years ago, in that descriptive observations that generate new hypotheses for basic models of phenomena are recognized as valuable and necessary and hence publishable as a stand-alone results." The National Public Radio(NPR) shared the list of most read education research articles published in 2014. Such list actually provides an insightful view of the current status of education research. At the top of the list is an article that tells us that, of all the novel ways of teaching arithmetic to young children, only the traditional method of direct instruction combined with routine practice and drills delivers a positive association with student achievement. This is surprising but what is really troubling is the fact that inspite of this article being widely read the other nontraditional methods though shown not to be effective remain popular among educators and education policy makers. The other widely read papers in 2014 are mostly about negative results. The degree to which instruction is aligned to the standards of a curriculum does not appear to correlate with learning outcomes. Short term certificates beyond basic education are not really useful. A curriculum that takes into socio-emotional learning may or may not help in reading or math. But there is hope in education research. With advancements in neuroscience and brain research, we are now starting to acquire and learn objective information. For example, we now know how the brain develops and how this development can be influenced by outside factors such as chronic stress. The brain has plasticity which suggests the importance of mindsets. This is certainly an avenue through which we can possibly understand more why poverty has a very significant impact on basic education. Education research has great difficulty going beyond what is fashionable. One reason is the absence of an overarching principle. Understanding how the brain develops may just be the missing ingredient. Of course, one other reason why education research is not in a good shape is, unlike chemistry, a lot of people think they are experts in education. Almost everyone has experienced schooling so everyone has a thing to say about education. However, with an overarching principle, we may be able to tell who the charlatans are and who the real experts are.